Public Art in the City: a three-part workshop and lecture program that examines the relationship between designers and visual artists and the politics of intervening in the city. Harvard Mellon Urban Initiative, Harvard Graduate School of Design, April 19-20, 2017. 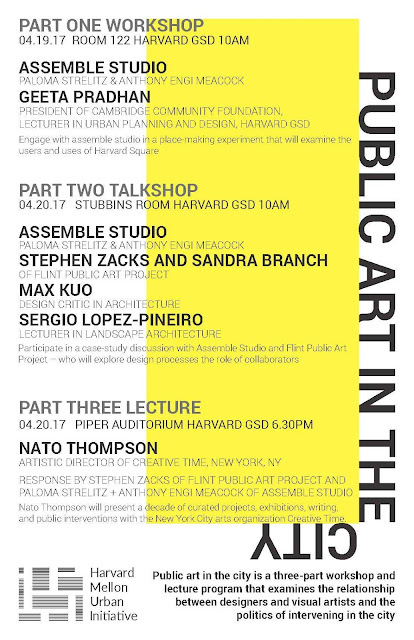 Stephen Zacks, founder and creative director of Flint Public Art Project, joins Flint's Sandra Branch, London's Assemble Studio, Geeta Pradhan of Cambridge Community Foundation, design critic Max Kuo, landscape architect Sergio Lopez-Pineiro, and Creative Time's Nato Thompson in this workshop/ lecture program at Harvard Graduate School of Design on the politics of visual artists and architects intervening in the city.